There is truly something for everyone, from expantant mothers, to beginners, seasoned yogis and children- we offer a wide & balaced variety of classes. A vinyasa based class that has elements of flowing, breathing and functional movement. The room is heated to between 90-100 degrees with a humidity level between 35-50%. We always tell people that if they think they might enjoy the heat and a good sweat to give the heat a try 2 or 3 times and see if it sticks. People find themselves drawn to the hard work, emphasis on breathing and steady pace to help focus their mind. Vinyasa style leaves room for creativity for the teacher so no two classes will be exactly alike but all classes will be safe for the body and rooted in movements that make you feel strong, stable and successful. The warm classes follow a similar flow and series of poses to the hot all levels flow classes, but for those who have less tolerance or taste for the heat, we offer these classes at a temperature of 78 degrees. Some of these classes are offered to music. Same as the All Levels Flow but instead of being 75 or 90 minutes the format fits into 1 hour. Classes offered in both hot, unheated and warm format. The schedule lists all details in the right hand columns. This one-hour class combines ballet conditioning, interval cardio, Pilates, yoga and meditation to strengthen your core, lengthen your muscles, center your mind and lift your spirits! This barre class picks up where others leave off by incorporating even more of the beneficial practices of yoga - playful arm balances, back strengthening and back bending to counter deep core work and keep the body in balance, inspiring mantras, meditation, and a philosophy centered in mindfulness, gratitude, compassion and interconnection. About once a month we hold a 4 weeks beginners series with Rhonda Skloff. This is great if you are hesitant to walk into an all levels class or if you want to get back to the basics of the flow. See the events section on the home page for our next series. Note, beginners series pause during the summer and resume in the fall. We also offer a beginner's class on Monday nights. All normal class packs and drop ins work for the Monday night class. 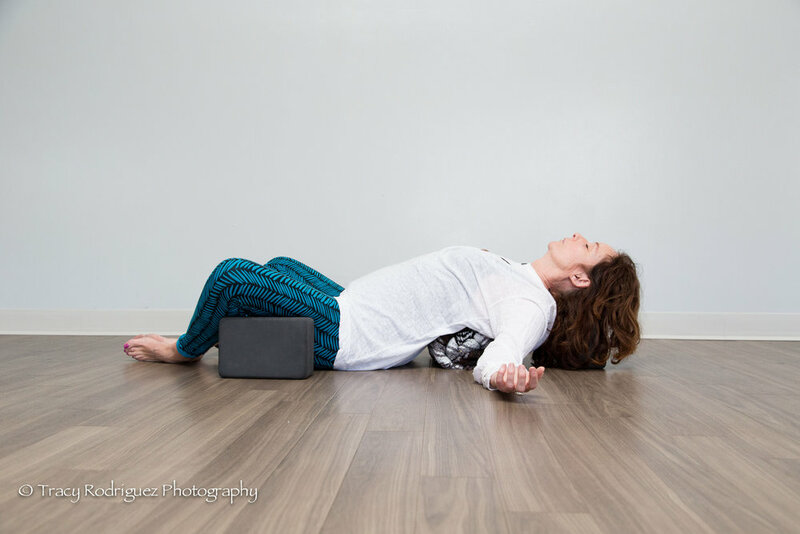 Yin Yoga is a wonderful complementary practice to the more dynamic flow classes you know and love! Yin offers an opportunity to slow down with long(er) held postures that help improve flexibility of the body and mind. The gentle but consistent stimulation of connective tissue helps improve long term joint health and flexibility and the longer, static holds also allow the mind to practice and prepare for increased focus and meditation practices by drawing the mind inward. Most postures are seated or supine and are suitable for all levels. A chance to slow down and give your body what it really needs! The body can do all sorts of amazing things and feel so much better if you just allow it to truly relax. This class has a slow flow that provides the opportunity to move mindfully and ends in long and restful poses that leave you feeling refreshed, focused and ready for productivity. Prenatal classes are offered in an unheated format, with a teacher who is specifically trained and aware of the restrictions an expecting woman has. Prenatal classes will focus on helping the expecting woman achieve that level of workout in a safe environment, and offer a more relaxing yoga practice that helps to allievate common pains associated with pregnancy. Our kids yoga classes are taught by teachers specifically trained to teach children postures that their nimble bodies are able to do safely, while providing a safe and fun environment for kids with 1 hour adult classes taught at the same time. Both you and your kids can enjoy yoga at the same time!